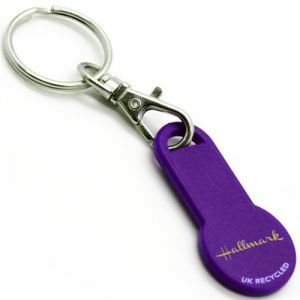 If you are looking to get your name in front of UK consumers, you can’t go wrong with a trolley token or trolley coin. 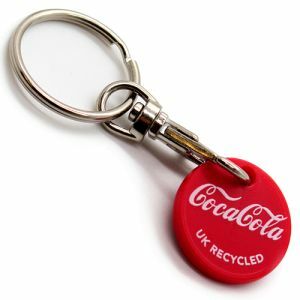 Made from lightweight, 100% recycled plastic, a branded plastic trolley coin will ensure your potential customers are never stuck without a trolley and you’ll be helping the environment at the same time as all our plastic trolley coins are eco-friendly. Added to a handy lobster claw and split ring fitting, your company name is on hand, helping out your customers when they need it most. Coin-activated trolleys became part of the everyday supermarket shopping experience in the mid-1990s but in a Morrisons' customer survey, 27% of shoppers said they didn’t always have a £1 to unlock a trolley, with 43% of customers finding the locks ‘inconvenient’. Some retailers have now removed the locks but many remain, leaving shoppers searching around for the correct change. And that's where custom trolley coins or tokens come into their own. 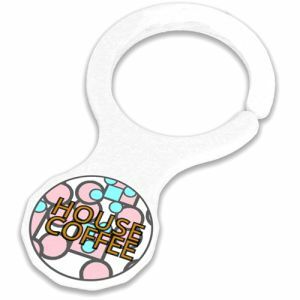 Our new shape recycled plastic trolley coin is a best seller and can be available in as little as 72 hours if you need it in a hurry. 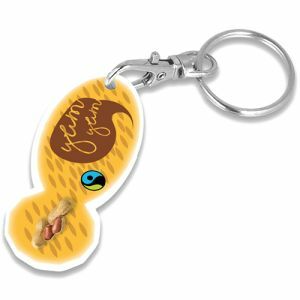 Printed with your logo, company name or strapline, this is a lightweight, high impact promotional trolley coin keyring that looks good too. 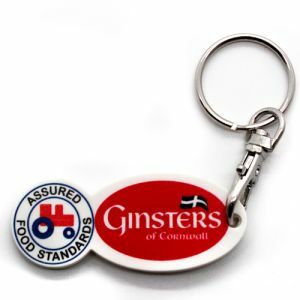 Get twice the branding with a rectangle combo trolley coin keyfob or oval combo trolley coin keyfob. 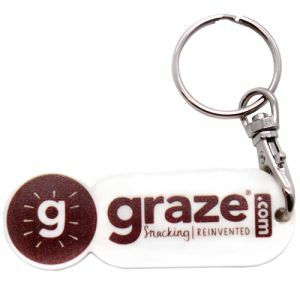 These newly added promotional trolley token keyrings feature a 12-sided plastic trolley token with a generous fob for additional branding. 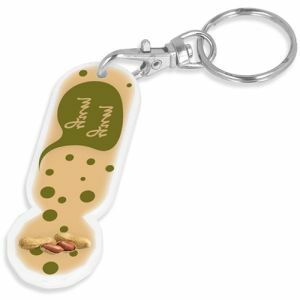 With plenty of space for your marketing message and contact details, these UK manufactured trolley coin and keyfob combinations are greater than the sum of their parts. For something completely flat that could be gummed to a direct mail letter or mailer, into a magazine or displayed in big glass bowls in reception or on a customer service desk, printed trolley coin clips fit the bill. 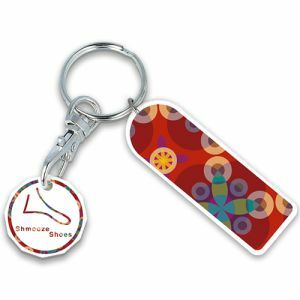 Neat and compact, printed to one or both sides in full colour, the trolley coin clip will also tuck neatly into a wallet or cardholder, hook around a handbag strap or belt loop or even hang on a hook alongside car keys so these are completely gender neutral. We also think they are fun, functional and trendy – the top three reasons people keep promotional products according to a PPAI survey. 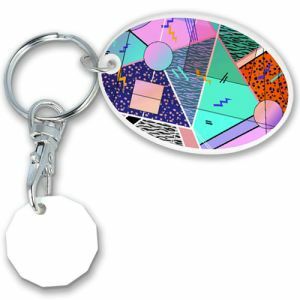 Corporated branded 12 sided trolley coin stick keyrings are a low-cost option if you want to combine the functionality of a trolley token with some extra space for marketing. We have a stick, oblong stick and oval stick versions to suit your company logo shape in single colour right up to full colour, and manufactured in 100% recycled plastic. And don’t forget that all our personalised trolley coins and trolley coin keyrings are also suitable for coin-activated lockers at sports clubs, health clubs, gyms and swimming pools so if your business has lockers, why not give away or sell branded trolley coins to save your customers or members having to search around for a coin, and help them spread the word about your business next time they’re at the supermarket too? 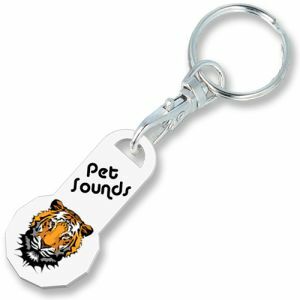 With both plastic and metal personalised trolley coins and trolley coin keyrings available, get in touch with the Total Merchandise team to discuss which option is right for you.